While point-and-shoot cameras aren’t as exciting as they used to be during those times when DSLRs where mostly reserved for professionals and our phones weren’t nearly as capable of taking good looking photos as they are today, manufacturers are still finding the way to make them a compelling purchase for those that want to do more with their photography but don’t necessarily need the features or the image quality provided by modern mirrorless cameras and DSLRs. The biggest advantages of choosing a compact or a bridge-style camera as your main tool for taking pictures would be the flexibility of having a massive zoom range and also the overall handling and controls (since using a smartphone and its touchscreen isn’t the most ideal and the most comfortable solution for those that like to take a lot of photos). For these and many other reasons, almost every popular camera brand on the market is still producing cameras with smaller sensors, but with big features. This time around we got the chance to check out the latest bridge-type camera coming from Canon, the SX70 HS. It’s aimed at those photographers that want to have as much flexibility as possible when it comes to zooming in and out and being able to take in a lot of the scene or focus on a particular subject in a matter of seconds. Canon has also brought a number of important improvements over the older model, the SX60 HS, namely the increased ISO range, faster shooting speed and better performance in general, better quality viewfinder, higher quality video recording (yes, the SX70 HS is capable of capturing 4K footage), lower overall weight and a couple of other things we will certainly mention through the course of this review. 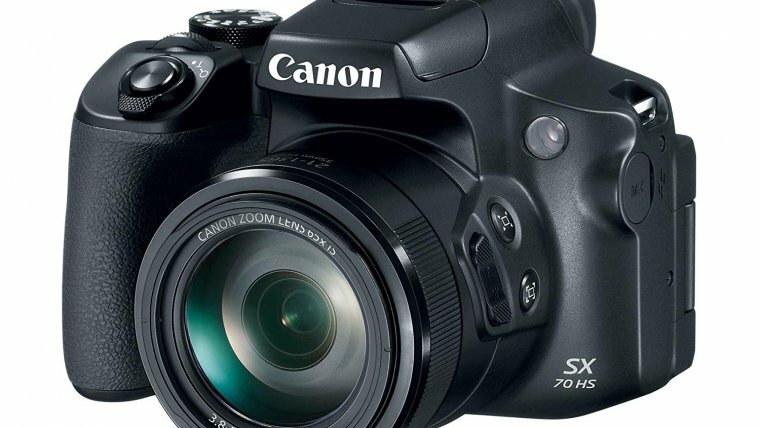 As always, before we start looking at more specific details that are a part of the Canon SX70 HS let us examine its specifications more closely and see how much it differs from its predecessor. The Canon SX70 HS may not be the most impressively built camera we’ve ever seen, but it isn’t built cheaply either and perfectly fits under the requirements one would have for a device of its class. We wouldn’t advise you to drop it often or two use it under extreme weather (since it isn’t officially sealed from the effects of rain, dust, heat or cold nor is it made out of magnesium or aluminum) but we still wouldn’t worry too much about its ability to stand the test of time and remain perfectly functional after many years of heavy usage. It’s easy to notice that a lot of care has been put into creating a tightly assembled plastic body and responsive and tactile controls, but that particular decision has also been made to keep the overall weight down to a reasonable level. Even though it’s more advanced than its predecessor in almost every way, the SX70 HS is lighter and easier to manage after a long day of shooting and you’ll certainly want to carry it much more often with you on your travels or even casual walks or trips to the nearest park. This camera will also be a pleasure to work with for those who have used one of Canon’s products from the PowerShot line up and even one of their DSLRs because of its familiar user interface and the classic control scheme which includes all the important dials and buttons you would ever need, but the lack of a touch-sensitive LCD screen will make it a little more difficult to operate and get a grasp of for those people who are used to their smartphones being their primary tools for taking photos or recording videos, but on the flip side, it should motivate you, even more, to learn about your new camera and all of its important controls (since the method of using physical buttons is still the preferred one for the majority of photographers out there despite the fact that the touchscreens are more reliable than ever in these modern times). Now, keeping up with the tradition, let us see what exact features are included on the SX70 HS and its body. The front of the device holds the focus assist lamp and the centerpiece of the entire camera, the optically stabilized 21-1365mm lens, but also some additional things like the control ring, a lens hood/filter adapter thread, the Framing Assist-Seek and the Framing Assist-Lock buttons and also the zoom button. The aforementioned Framing Assist buttons are very interesting additions by themselves; the Seek button can be used to improve your composition when you’re zoomed in to your subject by zooming out, placing a white frame around that subject (helping you get a better view of the framing you’ll get while you’re shooting at the telephoto range and also allowing you to change the subject more quickly) and zooming back in when you release the button while the Lock one has been programmed to help you keep your point of interest in the center of your frame when you find yourself using the longer end of the zoom range by using the built-in image stabilization technology and trying to correct your hand movement which becomes quite apparent in these types of shooting scenarios and could otherwise leave you with a blurry photo or a poorly framed one. Moving on to the sides of the Canon SX70 HS, the left one is where you’ll find the external microphone jack, while the right one houses the remote switch port, as well as the HDMI and the USB ports. The top of the camera is where the stereo microphones and the pop-up flash units are located (although one thing is missing and that is the standard hotshoe port that would allow you to connect an external flash unit), as well as the Wi-Fi, On/Off and the shutter buttons (it also holds the zoom lever) and also the main mode dial (it will allow you to switch between different shooting modes and also create custom ones thanks to the included C1 and the C2 profiles) and also the main control dial. The tripod socket and the memory card/battery pack compartment can be found on the bottom of the camera, as is the case with most of the devices of this type. Lastly, there’s the back of the camera. Besides the usual things like the articulating LCD screen and the electronic viewfinder (and its dioptric adjustment knob), you’ll also be able to find the Movie recording button, the four-way navigation controller (together with four functions mapped to each of its directions and these are Exposure compensation, Flash, Single-image erase and Macro/Manual focus) and also, the AE lock, AF point selector, Info, Playback and the Menu buttons. So, in a nutshell, there’s no shortage of buttons and controls to play with, even if you consider yourself to be an advanced user. Some of you could be bothered a little by the lack of a touch sensitive screen (something that you’d expect to find on any modern device), but such an inclusion would noticably increase the overall price point and make the SX70 HS a less compelling purchase for those that want to save as much money as possible on their new camera. Still, thanks to Canon’s expertise in creating excellent user interfaces on their products for many years now the SX70 HS couldn’t be simpler to use and even all the beginners among all of you that are interested in photography won’t have a tough time learning about all of its menus and the functions included inside of them. The main shooting screen (the one that will provide you with all the necessary information like your exposure adjustments, active modes, remaining number of photos you’d be able to take until your memory card is full and so on) is also easy to read and the user interface as a whole is very reminiscent of those that can be found on any recent Canon DSLRs (which means that it’s more intuitive than it ever was on any of company’s point-and-shoot or bridge-type cameras). We also appreciate the fact that Canon has found the way to include specific features and modes that will appeal to those that have just started to learn about photography, but also allow them to grow with their new camera and explore more advanced ones later on. Besides the regular Auto mode that will give the SX70 HS the control over all the important settings, you’ll also be able to find other important modes such as Hybrid Auto (it will automatically record a short video clip before you take your picture and will combine those clips into one that will act as a summary of your day shooting with the camera), Sports Mode (it will help you take better pictures of moving subjects), Special Scene Mode (this is the mode you should be in when you master your feel for composition and you’re ready to learn about different types of lighting scenarios) and more. The Quick Control Screen will be your main way of changing most of your settings other than the aperture and the shutter speed (like the Drive mode, Aspect ratio, Image quality, different AF options and so on) and is as easy to work with as the rest of the user interface. You’ll also be able to choose the amount of information displayed on your screen while your taking or viewing your photos by pressing the Info button, save custom sets of settings that will allow you to quickly adapt to different shooting situations (for example, you can have one that is optimized to shooting in broad daylight and one in low light), set up the built-in pop-up flash unit just the way you want it (with options like Flash exposure compensation, Shutter sync, Red-eye lamp and Safety FE), enable the Digital Tele-Converter option to get more reach out of the included lens, but with some expense to overall image quality and play around with a lot more features that will make your life easier and your time with the SX70 HS more fun and rewarding. Lastly, we need to talk about all the wireless capabilities, something that has become an integral part of almost every device on the market that has to deal with any kind of communication with other devices in its vicinity. There’s a surprising number of features at offer here; the SX70 HS can either connect wirelessly to a smartphone or a tablet device, a computer or a laptop, a Wi-Fi enabled printer and also directly to a web service of your choice thanks to Canon’s own Image Gateway service. If you decide to pair the SX70 HS with your smart device you’ll be able to do things like sending your images automatically to the camera while your taking them, use the screen of your device as a remote viewfinder for those occasions when you have the camera on your tripod and you need maximum stability, change a myriad of different settings while shooting without even touching the camera and also geotag your photos with the help of your smartphone’s GPS system. Having both the Wi-Fi and Bluetooth at your disposal also means that the SX70 HS will try to save as much energy as it can when performing those tasks that don’t necessarily need the fast transfer speeds of Wi-Fi, since Bluetooth is noticeably more efficient technology by itself. Additional non-smartphone related features will also allow you to set up automatic transfer of images when the camera is connected to the same network as your computer, upload them to a web service of your choice within the Playback menu or easily print them by help of a wireless printer just by selecting that function within the aforementioned part of the user interface. In the end, the Canon SX70 HS may not be comparable with some of the company’s higher end devices (we wouldn’t expect it to be), but despite a few of its shortcomings (no weather sealing, touchscreen or a hotshoe port) it still manages to bring a lot to the table for a camera of its category and type like very good build quality, a very familiar control scheme, a pretty decent electronic viewfinder, a fully articulating LCD screen, an excellent user interface lifted straight from Canon’s DSLRs and mirrorless devices, a very flexible lens and quite an advanced set of Wi-Fi related features. With its 9-point contrast detect AF system the Canon PowerShot SX70 HS surely doesn’t sound like the most advanced camera around, but you’d be surprised how well it manages to hold its own after you’ve started using it in the real world. No, it won’t blow you away in case of subject tracking or focusing in low light, but it will perform even those demanding tasks on quite a respectable level considering the rather simplistic AF system the camera has to work with and the class of cameras it belongs with. Taking pictures of any kind of still subjects shouldn’t be a chore to anyone with even the slightest knowledge of how a camera works and even taking a photo of anything moving around your frame can be achieved with success if there’s enough light in your scene and you’re subject isn’t moving too rapidly or too unpredictable. You will notice some drop in performance when you get closer to the end of the zoom range, but that is to be expected from a camera capable of shooting at such extreme focal lengths. It’s also a joy being able to put it to your and enjoy the benefits of the built-in EVF (it helps a lot with nailing your focus, as well as the composition and the exposure) and its also great to see that the SX70’s lens is capable of focusing very close to smaller subjects, allowing you to take very effective photos of things like bugs or flowers. Like any other camera on the market the SX70 HS will allow you to choose between three basic focusing modes; the One Shot AF will be the one you’ll be using most of the time to take regular everyday pictures, the Servo AF will help you focus continuously and shoot any kind of moving subjects, while the Manual Focus option will give you the ability to nail your focus in dim lighting conditions or precisely choose the part of your subject that you want to make as sharp as possible. Canon has also decided to include a very helpful feature in form of Focus peaking, something that is essential to have if you want to focus manually with more success and without having to change your framing by having to magnify the things you see on your screen. There’s also another way to fine tune the focusing system of the SX70 HS and that is by choosing one of the built-in AF Methods. There are four of them in total and they are: Face+Tracking (this one is best to be used if there is any number of people in front of the camera and especially if there are any other details that could otherwise confuse the camera’s AF system if you do not specify that its priority should be people’s faces), Tracking AF (a simple tracking mode that will give you the option to pick your subject and tell the camera that it should try to keep it in focus even if it’s moving), Spot AF (this is the mode you should be using for shooting pictures of very small subjects that require very high precision or if you want to focus on one exact part of your subject or the scene) and lastly, 1-point AF (if you’re not shooting any kind of moving or small subjects, this is the method you should rely on most of your time as it will give you the best overall results). 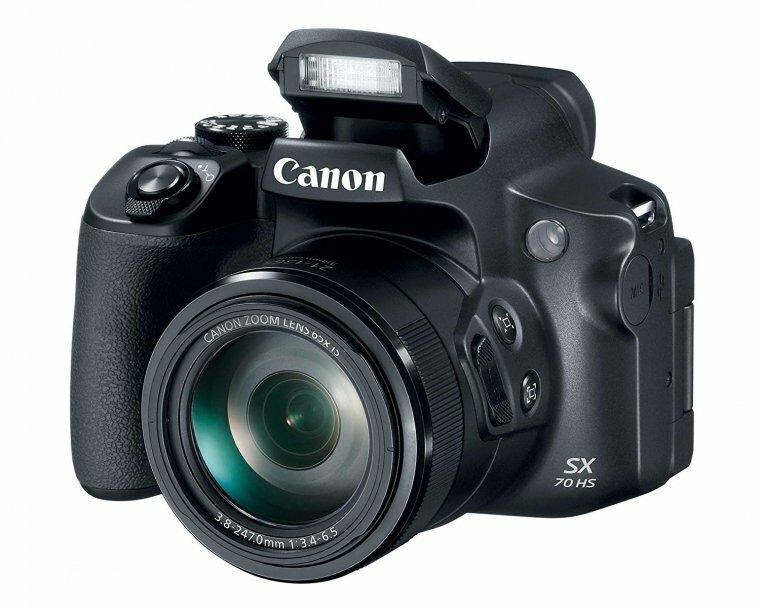 Not only does the Canon PowerShot SX70 HS offer a lot in terms of it focusing capabilities and numerous ways to make the AF system adapt to different types of situations, but it also doesn’t disappoint in terms of its overall performance and responsiveness, shooting speed and also, the battery life. You won’t have to wait for more than a second for the camera to power on and become ready to take the first photo, but the same holds true for its focusing speed in general and also the shot to shot times. We still wouldn’t go as far as calling it one of the fastest cameras around or even comparable to a lot of DSLRs and mirrorless cameras, but compared to other devices in its category it exhibits quite a reliable and satisfactory performance and you’ll only ever feel it slow down is if you decide to shoot in very dark conditions, as you’ll sometimes have to wait for around two seconds for the AF system to become sure that it has correctly focused on your subject. The SX70 HS also offers a surprisingly usable burst rate of 10 fps (5.7 if you want the continuous AF option) and with the use of a fast SD card it will give you the opportunity to get around 20 RAW or 45 JPEG images after it fills up its buffer (which by its own may not be a very impressive performance, but it really is when you take into account the fact that it doesn’t take too long for it to clear the buffer and become ready to shoot again). You’ll also be able to get around 325 shots per one charge thanks to the included LP-E12 lithium-ion battery pack, which is about average for this type of a camera and will allow you to get through an active day of shooting and recording videos (unless you’re more interested in the video side of things, especially if it’s of the 4K variety). Those who take video production seriously will need to invest in an additional battery pack, especially due to the fact that the SX70 HS doesn’t support charging over USB, so you won’t be able to make use of your external battery packs that you probably carry with you on most of your travels. 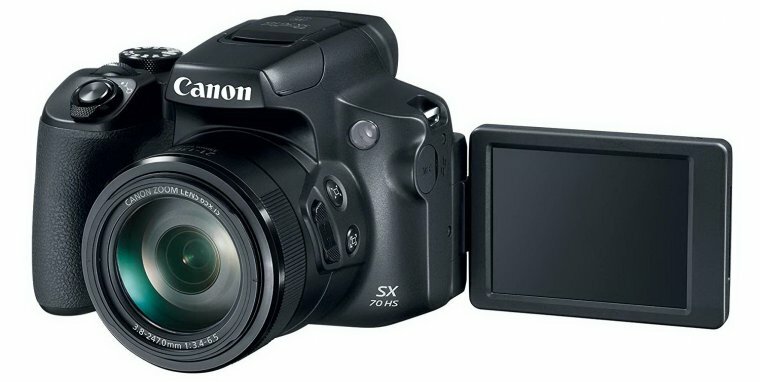 While the previous models from Canon’s range of SX cameras were mostly reserved for those enthusiastic mostly about photography, the company has finally decided to change their ways and put more focus on video recording with the release of the SX70 HS and also appeal to those who want a camera that can provide them both with good photos and videos. While there are a couple of reasons why the SX70 could be considered a respectably capable device to record movies with, the main reason why that is the case is surely its ability to capture content in 4K resolution. Couple that with the included 1080p 60 fps mode and you’ve got the best of both worlds; the ability to record highly detailed videos but also those that would allow you to create slow motion effect but also at a decent quality. Optical image stabilization is also on board, as we’ve mentioned earlier in the review and is as useful for handheld videos as it is for taking stills. It will allow you to get quite stable footage even if you don’t necessarily have the steadiest hands out there and will help immensely when shooting while you’re zoomed in a lot. The built-in microphone jack will allow you to record very pleasant audio, the fully articulating screen will be much appreciated by anyone from the vlogging community, while the full-time Movie Servo AF feature will give you the option to concentrate more on capturing the right moment instead of having to worry about focusing correctly. The focusing capabilities themselves still don’t offer the same level of finesse and refinement as on those Canon cameras with Dual Pixel AF systems, but considering the limitations of contrast detect technology the company has done a pretty decent job of making the most out of it and some of its shortcomings when it comes to video recording. Now, on the most important part of this entire review, the image quality. This is something that hasn’t been the strongest suit of superzoom cameras in the past and there were very good reasons why that was the case; older sensor technology, slower processors, complex lens designs, the lack of support for the RAW format, less effective image stabilization system and so on. 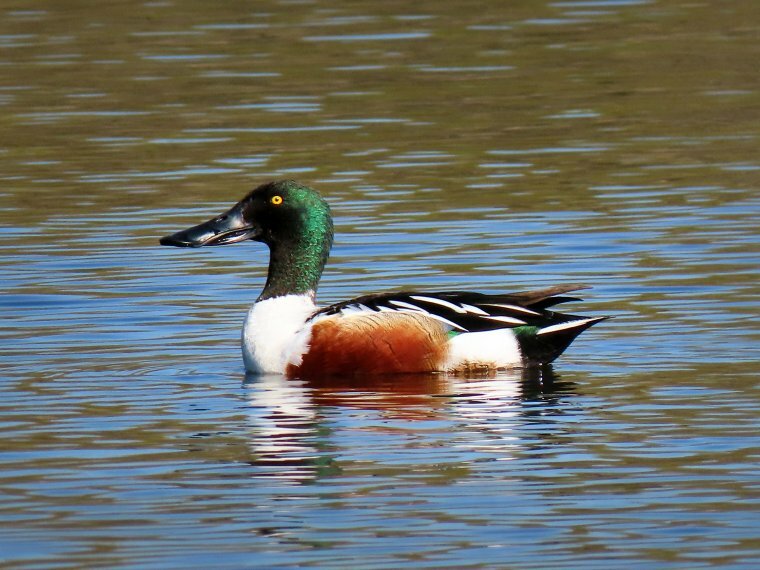 Now, even with the latest trends in modern technology reaching cameras like the Canon SX70 HS, it is still a challenge for manufacturers to find the right balance of camera size, image quality and the overall cost. Judging by the results we’ve achieved with this camera, both in ideal conditions and in low light, we can safely say that Canon has done a very good job of achieving the right balance for a fairy priced bridge style camera with a smaller sensor. While a combination of a 20-megapixel resolution and a 1/2.3-inch sensor may not have been an ideal matchup in the past, the advancements in the power of consumer cameras have allowed for much better processing algorithms and that is also the case with the SX70 HS. You shouldn’t expect impressive levels of sharpness or very large amounts of captured details, but you also won’t be getting soft or over sharpened photos either and realistically, you shouldn’t expect more from a complex camera such as the one mentioned through this review. Shooting in low light and at higher ISO levels will give you noticeable softer photos but shooting in RAW will give you some room to bring back the details that were previously lost due to noise reduction applied by the JPEG engine. Lastly, we should mention all the filters and effects you’ll be able to play with if you make the SX70 a part of your photography gear. These are split into two groups: Creative Filters and Styles. Inside the Filters you’ll find things like the Grainy B/W, Soft focus, Fish-eye effect, Art bold effect and more, while the Styles themselves hold all the necessary tools that will allow you to adjust the look of your images by yourself but also some predefined ones like the Standard, Vivid, Neutral, Black and White and so on. There’s a lot to be said about the Canon PowerShot SX70 HS as a camera that tries to compete with a whole lot of other devices. It was made to appeal to photography beginners, enthusiasts who want the convenience of having as much features as possible inside of a one package, those who were used to shooting with their smartphones or point-and-shoots but are curious about the prospect of having a huge zoom lens, those who want to shoot photos and videos of wildlife but aren’t ready to invest unbelievable amounts of money to get a similar reach with a DSLR or a mirrorless camera and a few other types of audiences. We certainly wouldn’t put it together with the most exciting cameras currently available on the market, but that still doesn’t change the fact that a lot of things are resting on its shoulders. Still, Canon has managed to squeeze as much functionality as possible and still sell the SX70 HS at a reasonable price point. So, if you could accept getting average image quality and only decent focusing performance when compared to something like an APS-C or a Micro 4/3 camera and you could live without a touchscreen, a headphone jack or weather sealing, you’ll be able to appreciate the benefits of having an extremely flexible zoom range, optical image stabilization, a well-built camera body, very intuitive user interface, extensive Wi-Fi feature set, great handling, 4K video recording and more, in a device that won’t break your bank and will allow you to invest your money in other aspects of your life, but still enjoy photography as an art. If that ends up being the case than the Canon PowerShot SX70 HS is certainly a camera worthy of your attention.